Let´s face it, we all love Mexican cuisine. I am not sure if it’s the fusion of Aztec and European flavors, or, just the flavor of Jalapeños on almost any dish what makes Mexican food a delicious and unforgettable experience! It is delightful and mouthwatering to eat roasted peppers, or stuffed peppers with cheese, or any kind of chilie; in fact chilies are as important as the food itself; have you ever seen Mexican food without Jalapeños? I haven´t. Place all carrots in a saucepan with enough water to cover them and cook over medium heat until nearly boiling (7 to 10 minutes). Immediately drain the carrots and set aside to let them cool. Divide the cooled carrots into two 1-quart glass jars (or in a bowl to have them ready to serve). 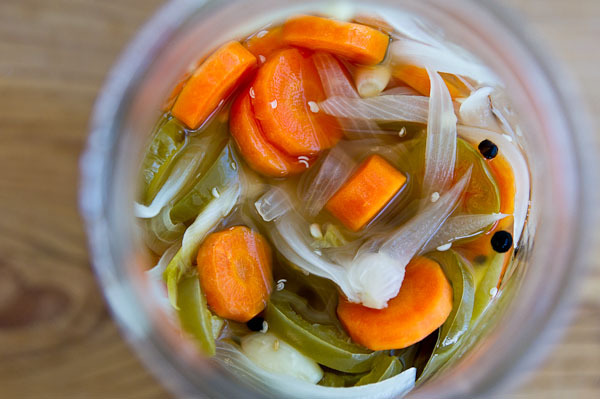 Alternate layers of onion and jalapeno peppers; top the carrots until the jars are full. Mix the liquid from the jalapeno peppers and the vinegar in a saucepan; bring the mixture to a rolling boil. Remove from heat and pour the liquid into the jars until full. Seal the jars and . Place the jars in the refrigerator until cold, at least 8 hours. After the 8 hours in the refrigerator, these spicy carrots are ready to eat! You will feel how that the flavor of vinegar and Jalapeños is now inside the carrots. Now you might be wondering how you can eat them. Easy, just spread them to Tacos, Nachos, Rice, Mexican Turkey Stew, Grilled Fish, Grilled Chicken, Tortilla Soup, Quesadillas etc. If you love to try new flavors, you even add them to Not-Mexican-Food (Spaguetti, Burguers, Sandwiches, etc) and heat up the flavor. One of the main benefits of including something spicy to your everyday meals is that if you are in a weight loss regimen, a touch of Jalapeño can make even the most bland diet food more palatable, causing you to be more likely to stick with your weight loss plan. In addition, they may jack up your metabolism. Remember also that Jalapeños contain Vitamins A and C, and these strengthen the heart muscle walls, and the heat of the pepper increases blood flow throughout your body. All of this equals a stronger cardiovascular system. Think about this twice! Not only you are eating healthy and enjoying every bite of your meal, but you are also helping you metabolism and health in general. More reasons to eat Jalapeños every day? Try these delicious carrots and tell me how the experience was!